Sometime in the summer of 2000, John Spielman, the Inventor and Father of Cross Country Big Ball and an all-around nice guy, became bored running around the local high school track to keep in shape. He tried throwing and chasing or hitting and chasing a baseball while running to add some “purpose” to his run. This made keeping in shape more interesting but it annoyed other people running on the track. So, John tried running off the track on local trails but the baseball he was chasing usually got lost. Around this time, John was also becoming interested in the game of golf. The idea of hitting a ball accurately over long distances to a goal intrigued John. However, John liked to run and golf doesn’t involve any running so John rarely played golf. One day while watching golfers in Ojai, John thought, “If golf was a race, you could stay in shape playing it and still enjoy the challenge of hitting a ball accurately over long distances and variable terrain to a goal”. As you would expect, John also realized that no sane golf establishment would allow such “races” on a regular basis. Furthermore, sooner or later, someone would get hit in the back of the head by a golf ball. John’s sons, Danny and Scott, played little league baseball. Occasionally for practice, John, Danny , Scott and friends would play “Big Ball” (baseball with a soccer ball) on the beach. 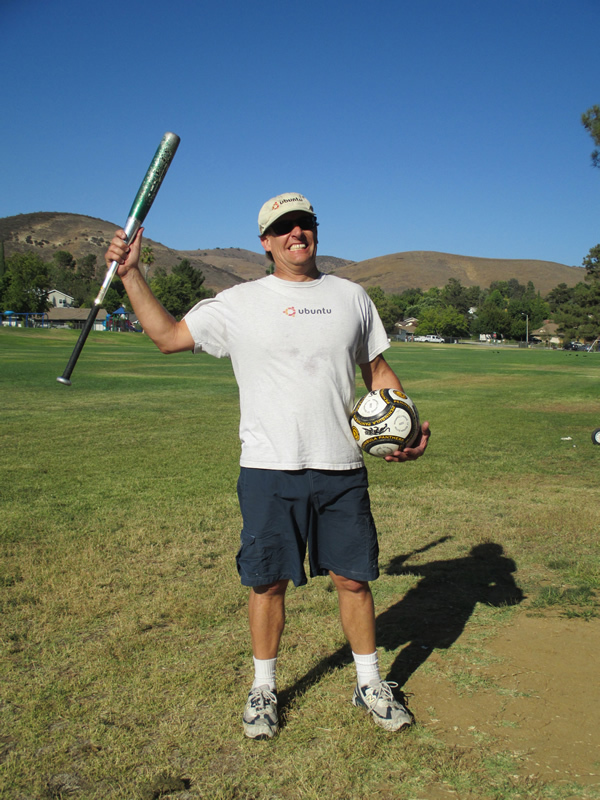 John persuaded his sons to join him in a race chasing soccer balls hit with baseball bats. Sometime in October of 2000 (no one knows the exact date), John, Danny and Scott had their first race at the local high school. They had a great time and people on campus that day still don’t know what they saw. Later, they discussed a name for the game. It was like “big ball” on the beach but it wasn’t baseball, you race to the goal, potentially across country (the word “cross-country” comes from hiking across open territory where there are no hiking trails). The name “Cross Country Big Ball” stuck and historians now agree that the sport was officially born on that day. Over time, John, Danny and Scott tried many theaters including parks and the local intermediate and primary school campuses. John had a great time and stayed in great shape. John Spielman is also the Father of Pool Vaulting, which involves jumping off a diving board over a crossbar, and the Father of High Pong, in which players bounce ping pong balls off a roof. His goal is to have all three sports that he’s invented included in the next Los Angeles Olympic Games. The Father of Cross Country Big Ball, John Spielman, raises his bat in the traditional victory salute.